The main difference between anger and hate is that though both are negative emotions that all humans feel at times, the anger does not last long whereas the hate usually persists for a longer time. Anger and hate are two emotions or psychological impulses that are common to all living creatures, just like and love. Both these impulses have their roots linked to unfavorable or unpleasant experiences. As a result, we humans, feel annoyed or angry, and these negative impulses most often remain within use for a relatively short period till a reasonable solution is given to the problem which caused anger in us. On the other hand, hate is an intense negative impulse that lasts longer and deeper than anger, and it might as well lead to worse outcomes such as revenge and grudge as well. Anger is a negative emotion common to all of us. It happens as a result of sudden irritation or annoyance when something frustrates us. However, it leaves us as soon as it comes to us. Therefore, it does not cloud other positive impulses or emotions we have. Imagine that you have taken so much time and trouble to finish a painting. But on the next day, you find out that your pet cat has stepped on it, and the painting is almost destroyed. You will obviously feel really angry. You will be angry with yourself and your cat. Yet, you will do something to resolve the problem and simultaneously, that emotion of anger will subside. Figure 1: Communicating anger is not hard, and it often helps us to overcome it. Unlike hate, we can easily voice our anger; this simple act will take our anger away from us. Therefore, anger is usually very short-timed or spontaneous and not much intense. Thus, the outcomes of anger are not that intensified as from hate. Similarly, anger is not hurtful to your or to others surrounding you. Moreover, both anger and hatred will have common biological impacts on us such as increased heartbeat, increased respiration, tensed muscles, disruptions in our neurological communication, often resulting in headaches and other related sicknesses. Similar to anger, hate or hatred is an emotion that is primarily negative. It has negative consequences for you as well as to others. Unlike anger, hate lasts longer and tends to be more intense, thus having more intensified consequences. Consider bullying in schools. That strong gang or a powerful child is bullying an innocent child for no mistake he has done, yet he becomes a victim of the one who finds happiness in deriving pain in others. The victim will obviously feel angry about this person, but being helpless he cannot do much to fight for himself. Thus, eventually, he will feel utterly disgusted by this brutal person and will end up hating him. This hatred will last long and might even end up giving root to grudged or revengeful feelings inside the victim; he might plan on taking his revenge someday when he is able and stronger. Here, it is most likely that hate is evident in both the one who inflicts pain and the one who suffers. Hence, hatred has very bad consequences for both parties. This emotion can be directed to individuals, entities, behaviours or even objects that cause discomfort and hurt in us. Therefore, hate is often associated with feelings of anger, disgust and a deep disappointment towards those who are hostile to us. Similarly, hatred lasts longer and is more pervasive. It is most likely that hate overwhelms other emotions in us and obscure everything else we might feel. It makes us want to take action, to hurt or destroy whatever gave birth to hatred within us. Moreover, unlike anger, where we can communicate or take action to resolve it, hate has a more solitary and, impeds us from communicating it to another. Similarly, it grows inside us even without our consent, aggravating within for longer without any resolution. As a result, we will feel like separating ourselves from others, with contrasting opinions, finding our solitude as a better option. Thus, hatred is a very painful experience, and it destroys who we originally are as well if we do not find a better way to overcome hatred. Thus, we should always think hatred can never resolve our problems, the more we hate, the more it destroys who we are and what we might become. 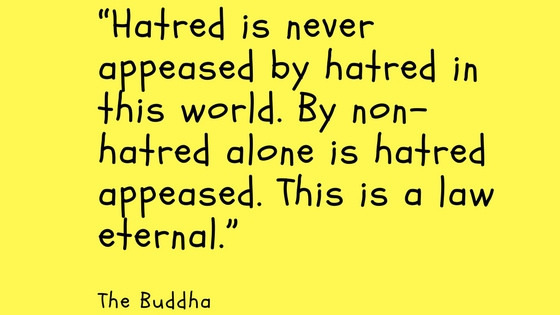 Therefore, as Lord Buddha preached, we can only win hate by not hating the other; “Hatred can only be oppressed not by hatred itself but by non-hatred like love and compassion”. Therefore, we should always remember, there is nothing so beautiful as forgiveness in our human lives. Continuous anger on the same root cause can lead to hate or hatred towards that specific cause. 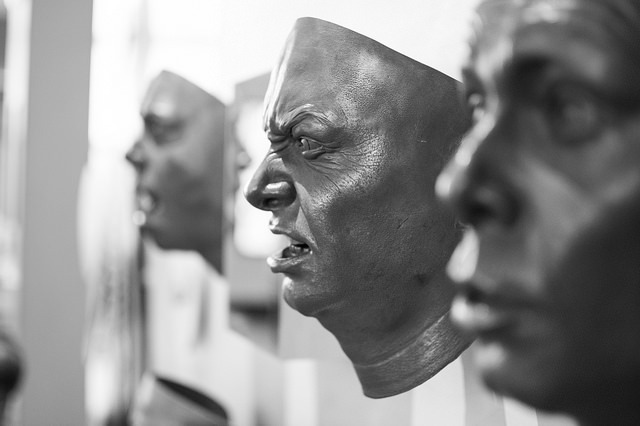 Anger is a negative emotion that all humans feel as a result of something that can cause irritation or frustration. On the other hand, hate is a negative emotion that occurs due to the persisted feeling of being threatened, disgust, irritation or anger towards hostility, etc. Anger lasts for a short time period whereas hate usually lasts for a longer time period, even resulting in revengeful grudges. This is the main difference between anger and hate. Root cause is another difference between anger and hate. The cause for anger is most often spontaneous whereas the cause for hate is deep-rooted and has been continuing for a longer time. Similarly, the intensity of anger is comparatively low when compared to hate; hate is more intense and deeper than anger. A person who feels angry will face other negative impulses and even sudden reactions to vent his/her anger on others. One who is filled with hateful impulses eventually will develop intense related emotions like revenge, grudge and strong disgust towards the cause. Eventually, he will be compelled to take intense and extreme reactions such as physical injury and damage etc. to regarding the cause. This is another major difference between anger and hate. 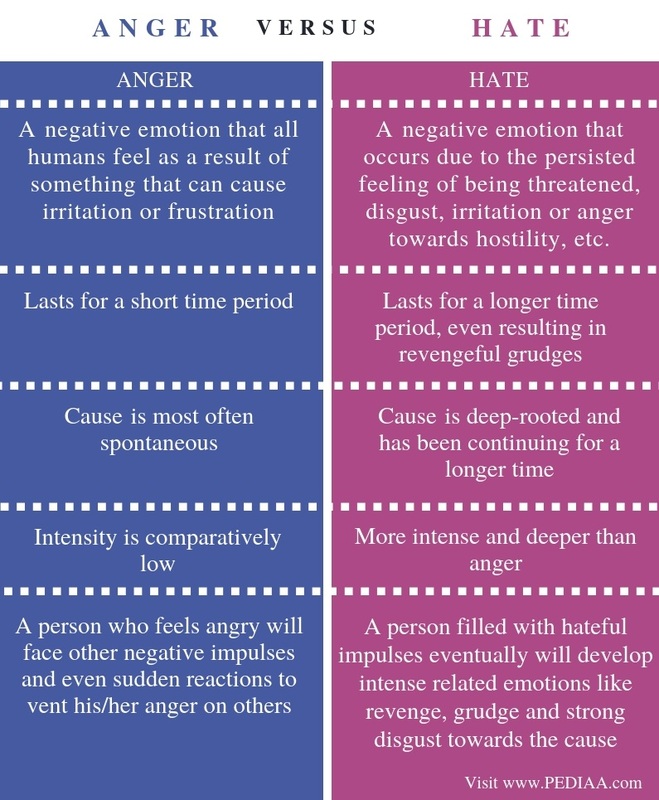 Although anger and hate have similar root causes and outcomes, the intensity and the duration of these two negative impulses distinguish them. The main difference between anger and hate is that anger does not last long whereas hate usually persists for a longer time. Moreover, the intensity of hate is very high compared to that of anger. However, both these emotions have negative consequences in the long-run. Therefore, we should know how to face these emotions in our lives.